Data from the Census Bureau shows that Building permits fell 8.9% to a 10-year low. "I would not make much of the fact that housing starts increased for April," wrote Ken Mayland, chief economist for ClearView Economics. "The real story is that they seem to be stabilizing at a moderate number." 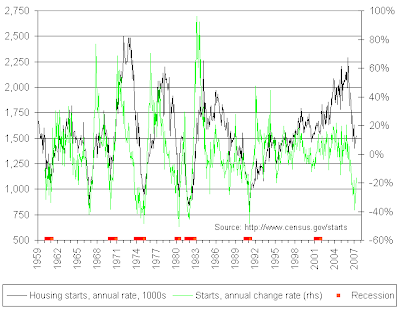 Housing is stabilizing at a moderate number? How do they come up with these assessments? If this was a game of bridge I would make a "penalty double" of that call. 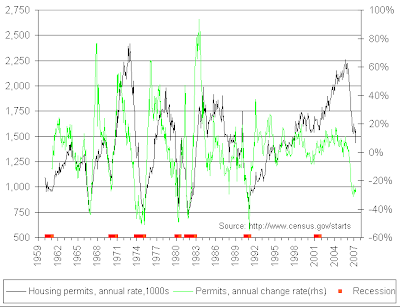 Starts are going to follow permits and the number of permits is clearly crashing. The above charts thanks to Bart at NowAndFutures. Click on either chart for a better view. Data from the Federal Reserve shows mortgage lending standards are tightening significantly. At least 23 of the 53 domestic banks surveyed, or 43%, tightened their mortgage lending standards, up from 16% in the fourth quarter. In its quarterly senior loan officer survey, the Fed said 31% of banks surveyed "considerably" tightened credit standards for subprime loans, while 25% of banks tightened those rules "somewhat." None eased standards. For non-traditional residential mortgages, credit standards also went up. Eleven percent tightened those standards considerably, while 34% tightened somewhat, the central bank said. No bank surveyed eased standards for those loans. Of the 44 domestic banks that originated nontraditional residential mortgages, 45% said they tightened standards for those loans. Those 44 banks accounted for about two-thirds of home mortgage loans on the books of all commercial banks as of the end of 2006, the Fed said. 15% of banks tightened credit standards somewhat for prime residential mortgages. Over the past three months, demand for all three types of mortgage loans has weakened, the Fed report shows. Twenty-eight percent of banks reported "moderately weaker" demand for prime mortgages, 29% of banks said demand for non-traditional mortgages was moderately weaker and 19% of banks said demand for subprime mortgages had weakened moderately. Meanwhile, 12.5% of banks said demand for subprime loans had gone down substantially. So, demand for loans is weakening as credit standards are tightening. This should be no surprise but apparently it will be to those who think housing is stabilizing at a moderate number. The key points here are that credit lending standards have just begun to tighten and inventory is still rising faster than these dramatically lower building rates. There is a chance this goes full circle, with down payments of 10-20% required and that down payment cannot be borrowed. Ahead of the housing permit numbers reports showed The Home Builder Confidence Index Plunged to a 16 Year Low. The National Association of Home Builders/Wells Fargo housing market index slid three points to 30 in May, matching the 16-year low set in September. Economists were predicting the home builders' index would remain at 33, according to a survey conducted by MarketWatch. The results show that roughly one-third of builders have confidence in the housing market. "This weakness suggests we should not expect a sustained rebound in starts anytime soon," wrote Drew Matus, an economist with Lehman Bros. [That was a good call - Mish]. All three components of the housing market index declined in May. The index of current sales fell two points to 31, a low for this business cycle. The index for future sales fell three points to 41, the lowest since September. The index for buyer traffic at developments dropped four points to 23, also the lowest since September. Builders' confidence fell in three of four regions. In the South, the index dropped four points to 33. The index fell three points to 32 in the West and six points to 32 in the Northeast. It rose one point to 23 in the Midwest. The Spring Selling Season was a Bust and that is adding to inventories. No doubt that is reflected in the plunging permits reported today. A spring home-selling season that's looking like a bust and pressure from growing inventories of houses in the resale market should intensify home-price declines in the second half of 2007, Wall Street analysts say. "We think the housing downturn has decisively moved to its second act of falling prices," wrote Deutsche Bank in a report to clients Monday. "With the first act consisting of significant retrenchments in volumes, the second act is one with home prices falling back to more equilibrium levels after a period of breathtaking increases during the housing boom," Deutsche Bank said. The signs are all in place not just for a continued housing recession, but for a full blown severe consumer led recession. Expect the Fed to cut rates in the second half. But also assume it will not matter one bit. This post originally appeared on Minyanville.